2015 Toro Timecutter SWX5050 steering wheel zero-turn mower, 200 hours, 50" fabricated deck. Nice mower! Now you can have your tractor and your zero-turn too. Toro’s innovative TimeCutter® SWX mowers are the perfect blend of both. You get the controls and side hill stability of a tractor with the maneuverability and time savings of a zero-turn mower. 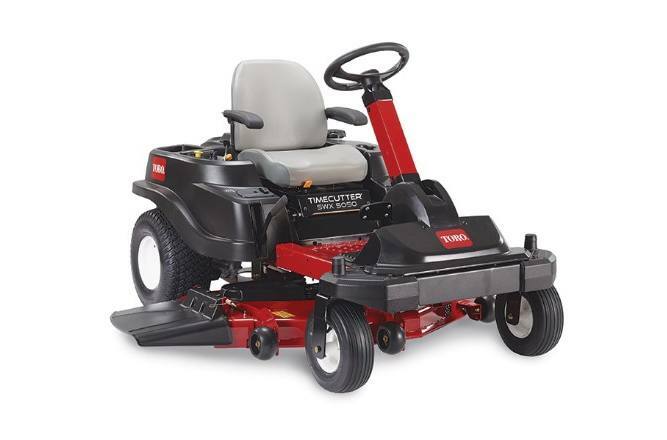 The TimeCutter® SWX5050 50 inch 24.5 hp Toro V-Twin 708cc with Self-Cleaning Air Filtration System Zero-Turn Riding Mower has a 3--blade mowing system under a 4 inch deep 10 ga. fabricated, top discharge deck design with convenient washout port. The mower boasts 7 cutting positions between 1-1/2 in. and 4-1/2 in. in height. Toro V-Twin Series Engine: The Toro V-Twin Series engine features a two-barrel carburetor, quick-drain oil hose, vacuum override choke and self-cleaning air filtration system. Maximum power, smartly designed maintenance. 50" (127cm) Mowing Deck: Toro's four inch (10 cm) deep, top discharge deck design provides superior cutting performance in all conditions. Anti-scalp wheels allow the deck to float over the turf and reduce scalping. Create your own natural fertilizer by adding a Recycler® kit or make yard clean-up a snap with an optional Twin Bagging system. Key Choice System: Remove the key to prevent others from mowing in reverse for added piece of mind. Width: 47.8 in. Deflector Up; Storage Dimensions (W x L x H) 47.8 in. x 78.9 in. x 45.9 in.